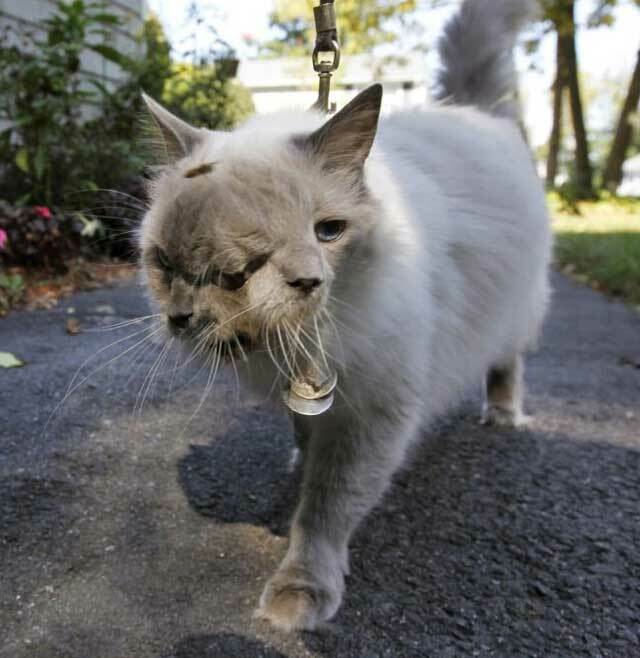 The world's oldest cat with two faces has passed away at the age of 15. Frank and Louie, a Guinness World Record holder, passed away at the Cummings School of Veterinary Medicine at Tuft's University in Grafton, Massachusetts, on Thursday morning, owner Martha "Marty" Stevens of Worcester said. Ms. Stevens said Frank and Louie had been "a little down" recently and she was administering some fluids, but on Thursday morning it appeared the cat was getting sicker and she raced to Tufts. As she was pulling together a funding plan for the cat's medical care, the clinic called and told her Frank and Louie was critically ill.
Frank and Louie during happier times. When she arrived, the cat was euthanized after veterinarians told her he was probably suffering from a "really bad cancer." While she is devastated, Ms. Stevens said she knows the cat initially had no chance at all after being brought into the clinic to be put to sleep in September of 1999. 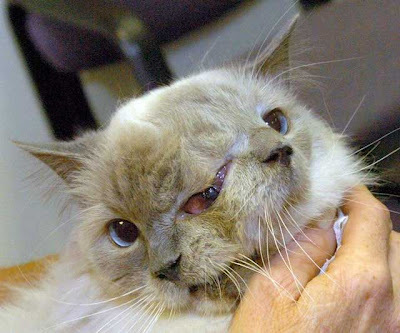 Janus cats, feline with two faces, typically don't live more than a few days and are often rejected by their mothers.